The boy in the yellow shirt was 35 when he visited me at my studio to commission me to create his painting, “Childhood Memories” Family Portrait Painting. He handed me a 30 year old, torn, water damaged, sepia tone photograph and wanted a painting in color with corrections. In the original photograph my clients leg was outstretched far out to the right that presented a very asymmetrical pose. He wanted me to adjust his leg and foot to a natural childlike position that would add symmetry to the painting. I had many children pose for me so I could measure and adjust the painting. Since the portrait painting was so faded I asked my client to send family pictures and instead of using sepia tones a muted color scheme was developed to bring my client’s childhood memory to life. 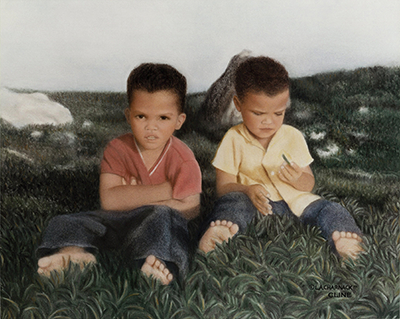 This pastel painting portrays the carefree days of brothers playing within the beautiful landscape of the Grand Cayman Islands.